BAP Pisco is a new multi-purpose landing platform dock (LPD) under construction for the Peruvian Navy. Image: courtesy of Galería del Ministerio de Defensa del Perú. BAP Pisco (AMP-156) was launched in April 2017. Image: courtesy of Galería del Ministerio de Defensa del Perú. A close view of the bow section of the BAP Pisco landing platform dock. Image: courtesy of Galería del Ministerio de Defensa del Perú. BAP Pisco (AMP-156) is a new multi-purpose landing platform dock (LPD) being built by SIMA-Peru Marine Industrial Services for the Peruvian Navy. The ship is a variant of the Makassar Class LPDs in service with the Indonesian Navy. The multi-purpose vessel is intended for the rapid transport and landing of the forces in support of amphibious warfare missions. It can conduct operations within the national maritime domain or operate as part of an international task force to provide humanitarian and logistic assistance during natural disasters. The BAP Pisco multi-mission LPD is scheduled to be commissioned into the Peruvian Navy by the end of 2018. The landing platform dock is being constructed by SIMA with assistance from South Korean company Dae Sun Shipbuilding and Engineering, which is responsible for providing design drawings, certifications and technical assistance for the construction of two LPDs. The Peruvian Ministry of Defence signed a memorandum of understanding (MoU) with Dae Sun Shipbuilding for the construction of two LPDs in Peru, in April 2012. A collaboration agreement was signed with the Dae Sun for the construction of the vessels at SIMA Callao shipyard, in October of the same year. In early-2013, the Peruvian Navy, under a project named Recovery and Improvement of the Transportation Service and Logistic Support of the Armed Forces, placed a $60m-worth contract with SIMA to build the first ship. The keel-laying ceremony of the first LPD was held in July 2013. The construction, however, began in the second half of 2014, when SIMA received the steel plates for the assembly of first blocks of the ship. Construction of the BAP Pisco is solely handled by the engineers and technicians of the SIMA-Peru Marine Industrial Services. 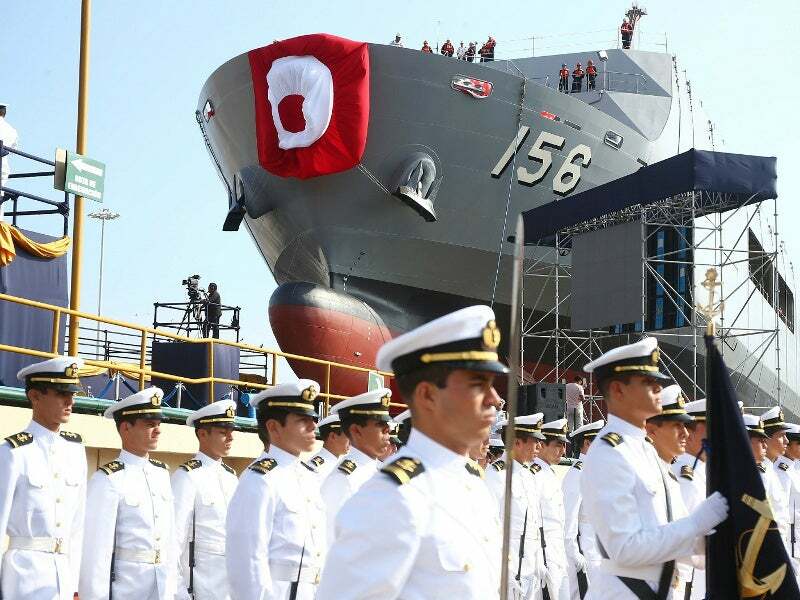 The Peruvian Navy christened and launched the BAP Pisco in April this year. The ship will undergo harbour and sea acceptance trials later on in the year. The trials will assess the power supply, hull and machinery, stability and the propulsion system to ensure the reliable operation of the vital onboard equipment and systems. The vessel measures 122m-long and 22m-wide, and has a draft of 4.5m and displacement of approximately 11,390t, making it one of the biggest ships in the Peruvian Navy. The LPD is equipped with a small well deck, which can accommodate two 23m landing craft utility (LCU) units, while the cargo deck of the ship can house 24 amphibious vehicles and either 18 tanks or 13 heavy trucks. The ship can accommodate 157 crew members, including 14 officers and air group personnel, as well as up to 400 marines. It can carry 636t of fuel, 600t of fresh water, 360m³ of dry cargo and 136m³ of food. It can also integrate mission-specific modules such as containerised hospital and surgical units. "It can conduct operations within the national maritime domain or operate as part of an international task force to provide humanitarian and logistic assistance during natural disasters." The 1,023m² flight deck of the LPD features two landing spots for two medium or one heavy helicopter. The ship also offers a hangar facility for the storage of a single helicopter. The armament suite aboard the vessel will include a BAE Systems 40Mk4 40mm anti-aircraft gun system, two Rafael Typhoon 30mm remote weapon stations (RWS) and four Rafael Mini Typhoon 12.7mm remote-controlled units. The landing platform is equipped with combined diesel and diesel (CODAD) propulsion system. The power plant includes two MAN B&W 8L28/32A diesel engines with a rated power of 1,960kW each. The propulsion system provides a maximum speed of 16.5kt and a range of 14,000nmi at a cruise speed of 13.5kt. This project forms part of our recent analysis and forecasts of the global Naval Surface Combatants and Warfare Systems Market available from our business information platform ‘Strategic Defence Intelligence’. For more information click here or contact us: EMEA: +44 (0) 20 7936 6783; Americas: +1 (0)415 439 4914; Asia Pacific: +61 (0)2 9947 9709 or via email. Based on a combined heritage of more than 300 years of experience, thyssenkrupp Marine Systems is one of the most prominent globally acting system providers in naval shipbuilding.